One Day More Fitness Blog: 100 Days of Keto Challenge - Day Twenty - Weigh-In Two! 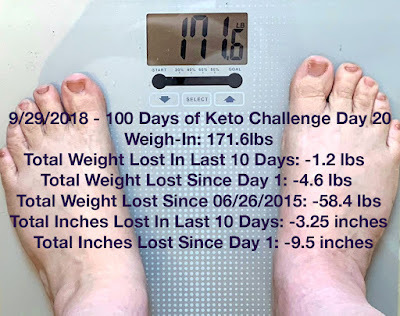 100 Days of Keto Challenge - Day Twenty - Weigh-In Two! 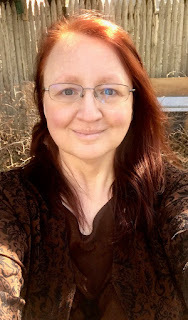 I'm going to be completely honest here and admit that when I first weighed-in this morning I was bitterly disappointed to the point of crying (yes, I know that's not a healthy reaction). I honestly expected to lose more because I did everything right but then I got all the numbers together and calmed down a little. First, 1.2 lbs may not seem like a lot for 10 days of hard work but seeing that it was almost 5 lbs in total of 20 days makes it feel a lot better. Also while my inches lost slowed down a lot that doesn't bother me as much because I know those will go down as I keep working out. I didn't have any problems staying on track for the last ten days, I'm still weighing and measuring all my food and I'm doing really well staying under 35 net grams of carbs. It's still bothering me that I can't weigh-in every day but it's getting easier (most days). My goals for the next round of ten days are to stick to the same plan and keep working out.